This time last year, Matt published his review of the enormous, decadent game of Gloomhaven. 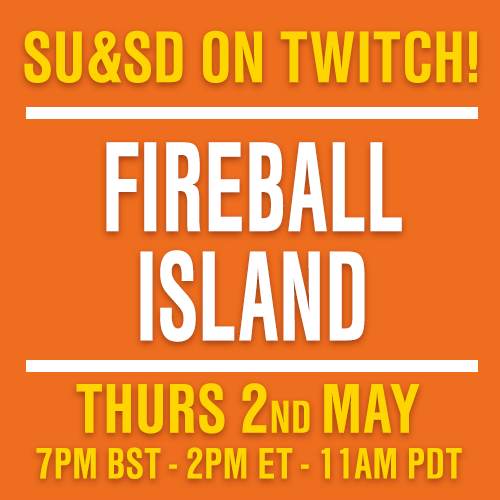 But since (a) it remains a superb game, (b) Quinns hadn't played it, and (c) it was the only way Matt could make progress in his campaign, this week we decided to break it out on our Twitch channel. More than two years ago Quinns reviewed the classic game of Brass, but ultimately came away disappointed (and wet, and riding high on sugar). Today, it's time for round 2! Introducing Brass: Birmingham, a collaboration between Roxley Games and original designer Martin Wallace, this is the sequel to Brass. Will this industrial revolution bring progress, or once again grind our reviewers' gears? Click play, and find out. This week we're proud to present our review of Root, which is surely the board game industry's new beau. A grand, inventive game of cat and mouse, as well fox and bird, and - should you buy the Riverfolk expansion - beaver and lizard. daddy lowlands, glassy-eyed virii, quintin speaks dutch? This week Paul and Quinns are excited to examine Lowlands, a svelte and confident sheep farming game in the style of venerable designer Uwe Rosenberg, BUT WITH A TWIST. At the end of the game your herds might wash away in a dreadful storm. Only one question remains. What wool they think of it? GOOD THINGS COME TO THOSE WHO WAIT! Container, the legendary contest of international shipping, has finally been reprinted. Inside this box are seven-inch resin container ships, it features a new module titled "The investment bank", and we've finally discovered that this game is an utter car crash. What's that you say? None of those sound like "good things"!? Pah, our viewers are philistines. Who wants to play a game about manufacturing forks! Anybody? No? What if we were to tell you that Arkwright turns the manufacturing of bread, forks and lamps into a bruising war. What if we were to say that this game puts the very machinery of the industrial revolution in your hands, and allows you to grind your friends in its very cogs. What if we were to tell you that this game is a cheaper, rock-solid competitor to fascinating games like Food Chain Magnate and Panamax. Would you want to play then? If you were looking for one game to rule them all, War of the Ring might be it. This magical game has more than 200 plastic miniatures, 40 pages of rules and a depth that most board games could only dream of. But what will Matt and Quinns make of it? For one thing, this wouldn't be the first time that Lord of the Rings was accused of being too long. 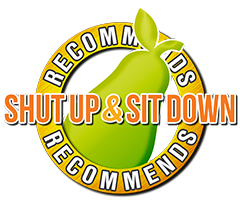 Click play, and let their opinions seep into your very bones. 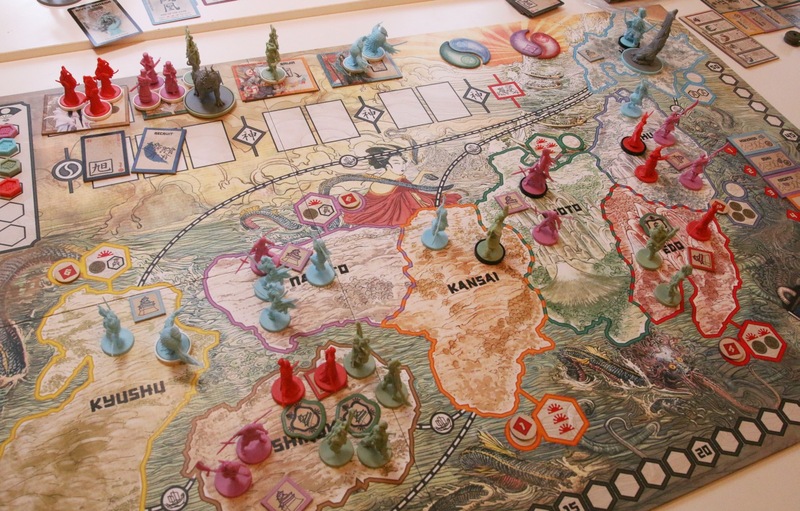 Matt: Rising Sun is a big-box Kickstarter darling filled with frankly massive plastic things, with a hefty retail price of £75 / $80. Set in a god-powered version of feudal Japan, players act as one of six different clans vying for control of those lovely islands. But the plus-size map and plastic armies are slightly misleading: Rising Sun is not what it appears to be. If you’re expecting a traditional game of nudging toy soldiers around a map, Rising Sun might leave players bored, confused, or quietly in a huff. But if you can get your head around what it is, and teach your friends what it is (and isn't), Rising Sun can be really very good. Think you've seen it all? THINK AGAIN. Sidereal Confluence: Trading and Negotiation in the Elysian Quadrant might have a silly name, but this hybrid sci-fi/negotiation/economic game is no joke. Whether you're playing space-wasps, space-squids or space-school teachers, it's going to demand every ounce of intelligence you can muster. Have you got what it takes? There's actually a good chance you don't. Quinns: Everybody, stand up from your chairs! Pull up your pants. Spit out that gum. An esteemed classic has returned. We reviewed fantasy town-building game Terra Mystica back in 2013 and found ourselves submerged in strategic nirvana. Today 28,000 people have rated it on BoardGameGeek, awarding it in an average of 8.3 out of 10. That’s shockingly high considering just how complicated and odd Terra Mystica is, with its challenging puzzle squished in between ugly mermaids and magic bowls. But there you have it! It’s just that enjoyable. 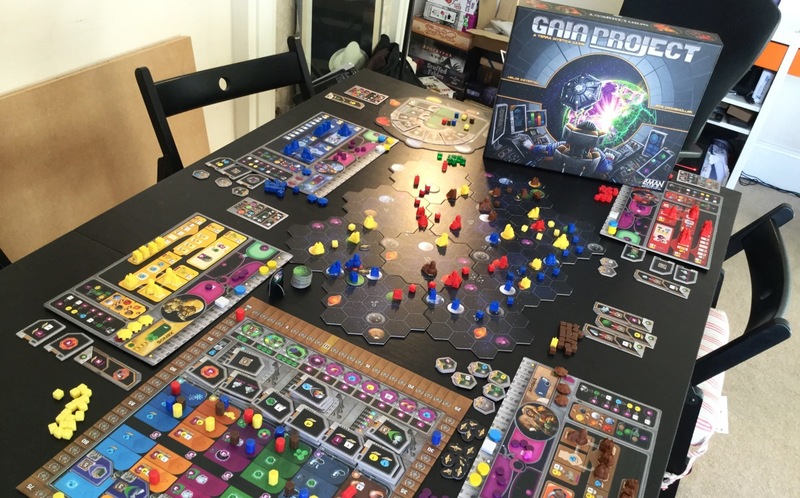 This week we’re looking at the sequel, Gaia Project, which is a big deal in more ways than one. As well as swapping Terra Mystica’s musty fantasy for a sci-fi backdrop, it’s more expensive, more complicated and demands significantly more table space. All set up, you’re looking at an asteroid belt of iconography.